We’re just a few weeks away from the official start of spring. But let’s be honest, living in Boca Raton, Florida we all know it’s practically spring now. We’re lucky enough to have warmer weather that allows us to jump right into the season’s latest trends early. These looks will have you at the forefront of cutting-edge fashion all the way until the summer starts to sizzle. 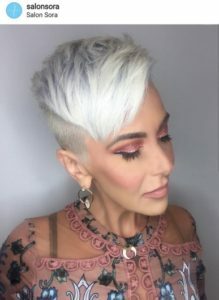 We’ve rounded up a few of our favorite beauty trends from hair to makeup in Boca Raton, FL for spring 2018 to share with you today. Pop of color lids- During New York Fashion Week many designers, including Marc Jacobs and Tracy Reese sent their models down the runway with colorful lids. Think turquoise, lime green, and punchy pink tones. We know, in real life these looks can look a bit dramatic, but there’s a way to make this trend wearable. With our tropical surroundings, this look can easily be achieved here in South Florida. We recommend swapping your go-to black/brown liner for a bright color. For a subtle look, apply the color on your water line. To make a statement rim the top and bottom of your lash lines. The low pony- When it comes to hair, the low pony was everywhere on the runway. We spotted several interpretations of the look, with a slightly off centered low pony being one of the most common. To give this look an added level of chic, consider pairing it with a side part. Fresh face- A healthy glowing face is always in style. Countless designers went with a bare skin look, which can be easier said than done. The trick to beautiful skin doesn’t start with makeup, it starts with skincare. Getting regular facials is a great way to perfect your canvas. It helps to even out skin tone, reduce the appearance of fine lines and pores, and gives you the glow we all live for. Then when you want to try the fresh face trend at home, all you have to do is apply a tinted moisturizer and radiant concealer to get the look. Remember to use makeup remover if you do put on makeup here in Boca Raton, FL to avoid breaking out and giving your skin a the break it needs. It’s all in the accessories- Hair accessories are an easy way to keep up with the latest spring beauty trends, some which you may already own. We never thought we’d say this, but remember the Scrunchie? Yep, it’s back. Add one on to your low pony, if it’s printed even better. If you’re feeling really creative, try your hand at Bobby pin art by using pins to create linear designs in your hair. Think triangles or diagonal lines. Long hair, short hair, anything goes!- In terms of hair style trends, there is something for everyone one this spring. If you’re all about growing out your hair and keeping your stands long, you’d be happy to know that we saw long lengths galore at most shows. On the other side of the spectrum, razor-cut boy cuts had a moment at the shows as well. What does this mean for you? 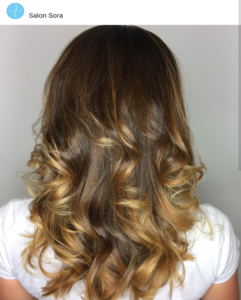 Pick the hair length that you feel most comfortable in and if you’re ready for a chop, let one of the experienced hair stylist at Salon Sora get you into a new cut for spring. These are just a handful of the spring beauty trends for 2018, what trend are you most excited to try?